I love the holiday season! Christmas lights, hot chocolate, baking, crafts .... it's my absolute favorite time of year! My kids and I had a ton of fun making a few simple ( I mean it- super easy!) kids Christmas crafts this past week. Each craft only requires simple materials (some of which you most likely already have on hand ) and about 20 minutes. Every one of these cute kids Christmas crafts would make adorable handmade presents for the kids to gift this holiday season too. 2 Pompoms in your choice of color (to make earmuffs) refer to image - affix with glue. White, pink, black, and orange multi-surface paint (or washable kids paint mixed with a small amount of Modge Podge). Paint the entire surface of both cans with white multi-surface paint. Allow to dry. Paint the face of your snowman allow time for drying. 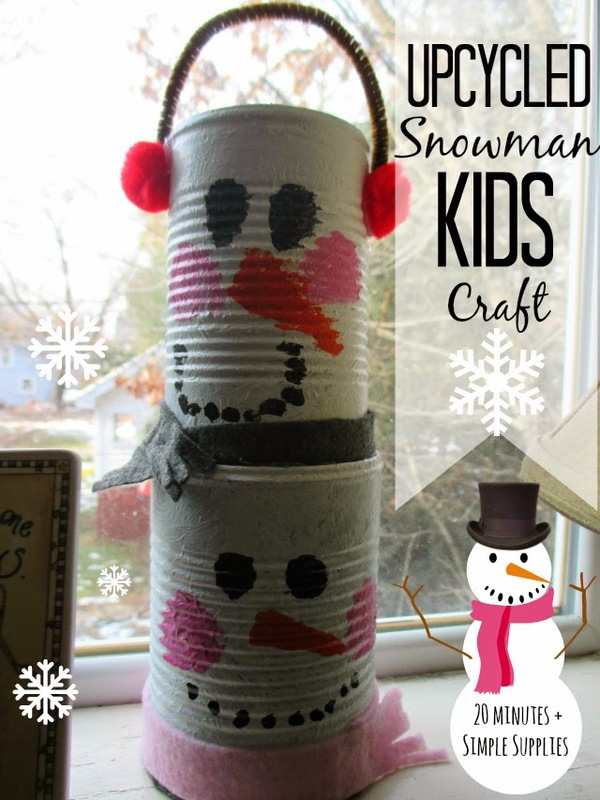 Felt in your choice of colors (cut thin strips to fit around the can to create your snowman's scarf - fringe on the end with scissors - affix with heavy craft glue or low temp hot glue gun. Next, cut a circle large enough to cover the base of your snowman (the bottom can) and affix with glue or a low-temp hot glue gun (this will protect the surface that you set it on from scratching). Small terracotta pots (1 for each of your "trees" - we found ours for .39 cents each at A.C. Moore. Green and white multi-surface paint or green and white washable kids paint mixed with a small amount of Modge Podge. Paint your pine cones green. Allow time for drying. Paint the tips of the pine cone white for "flocking". Allow Adequate time for drying. Heavy craft glue or low-temp hot glue gun and glue sticks (if using a low-temp hot glue gun an adult should complete this step) Glue the painted pine cone at the base into the terracotta pot. Allow adequate time for drying. Small Jingle Bells or Small Pom Poms (you could even use puffy paint for smaller children). Affix using heavy glue or low-temp hot glue to create the Christmas ornaments on your trees. 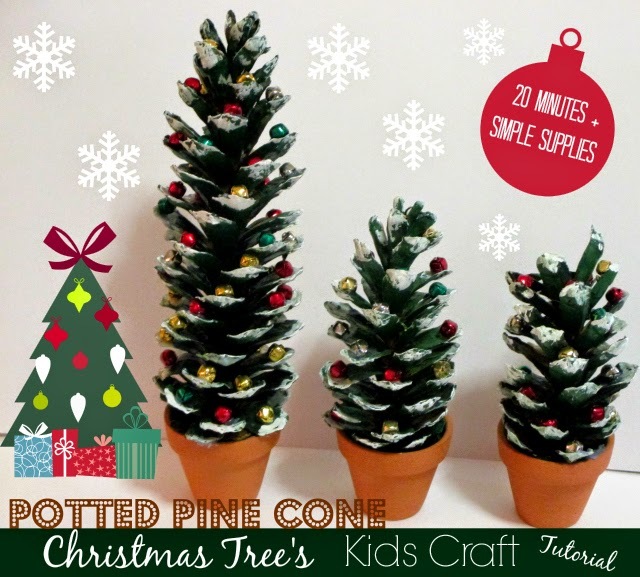 Or if your using puffy paint, dot small amounts of various colors on the tips of the pine cone. Allow adequate time for drying. Christmas ball (we used a clear non-breakable ornament for the pictured ornament above - we found ours at A.C. Moore for $1 each. You could also use a silver or color ornament as well. Remove the hanger from the ball temporarily so that you will be able to set the ball on it's top to dry (place the hanger back on the ball at the end after the ball is dry and complete). Paint your child's had white with the multi-surface paint. Sit the ball in the palm of their hand and have them wrap their fingers up onto the surface of the ball to capture their full hand print. Set the ball down on it's top (where you removed the hanger) to dry. Once dry - have the kids decorate each of their fingerprint "snowmen" with hats, scarves, earmuffs, eyes and mouth, a carrot nose etc. 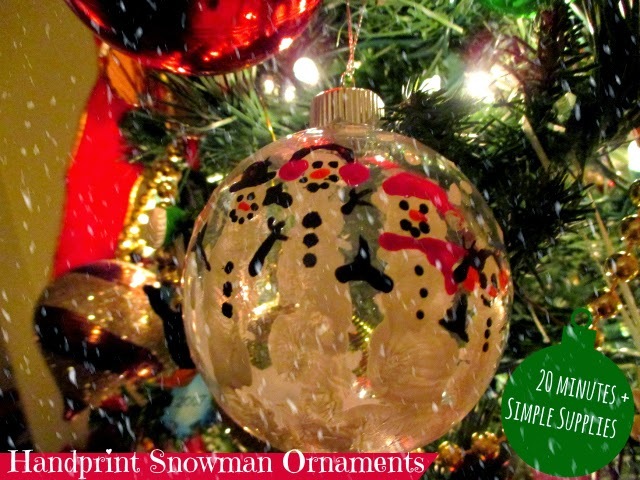 For an extra special touch have your child write their name, age, and year on the bottom of their handprint snowman ornaments. We hope that everyone has a magical holiday season! Happy Crafting!